Art gallery, galeria de arte, Galerie d'art, Kunstgalerie, Galleria di arte, Galeria de arte, ? ?, ???, ? ?, Galeria sztuki, KunstGalleri, Στοά τέχνης, 화랑, Sumaq Qawana, ????? ?, art gallery. The renaissance was a period when arts and sciences flourished. In these pages you will find paintings and sculptures in the tradition of the Great Masters of the renaissance. Our classical realism paintings are as diverse as portraits, renaissance style, religious paintings, landscapes, marine art, miniatures, academic art, small works, digital art, sacred art, Religious Icons, Catholic Art, still life and pets. Our photography portrays the tropics and Nicaragua. Our sculptures Celebrate the human form in clay and bronze. Here is our Site Map. For the enthusiast of painting we have created a page of Learn to paint. For your entretainmente we have brought to you a virtual Zoological Park. 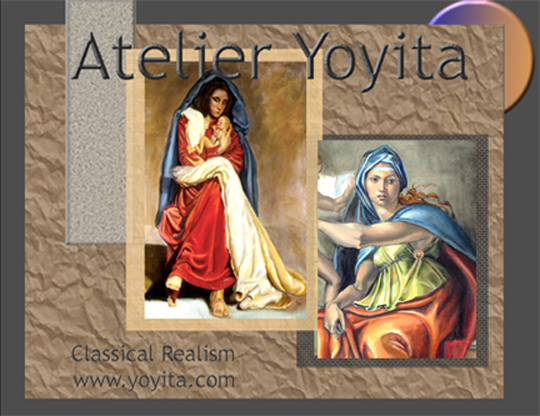 Atelier Yoyita Art gallery Copyright 1976-2012 Dr. Gloria M. Norris, Yoyita Click here to contact the artist.